Stardust galore: don't miss superstars Martin Freeman and Tamsin Greig in this world premiere! 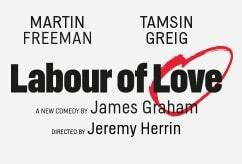 Martin Freeman and Tamsin Greig star in what is described as a razor sharp political comedy about the Labour Party, set in the party's traditional northern heartands where the clash and divide between party philosophy, class and culture couldn't be more divided. The production reunites writer James Graham with Headlong Artistic Director Jeremy Herrin following their previous collaboration on the National Theatre and West End hit play This House. No stranger to political plays, James Graham's works include The Vote which was broadcast on television on the night of the 2015 General Election, as well as Privacy which ran at the Donmar Warehouse and New York City. Adolescents under 15 will not be admitted. Recommended for ages 15 and above. Please note this play contains strong language. It was bloody marvellous, a great play with a fine cast.